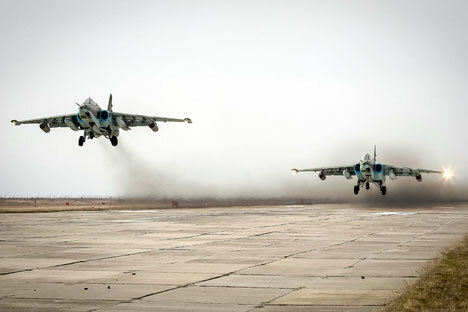 Russian mlitary jets leave Syria. The first group of Russian Sukhoi Su-24M frontline bombers returning from Syria have landed at an airbase in the Chelyabinsk region. As is tradition, the airplanes flew over the airfield in a tight formation at low altitude, thus greeting the crews' friends and relatives who had gathered at the airbase. Maj. Gen. Oleg Makovetsky, chief of tactical aviation combat training at the Russian Aerospace Forces Main Command, and Maj. Gen. Sergei Poletuchy, deputy commander of the Russian Central Military District's forces, also came to the airfield to attend the ceremony to greet the pilots. Number of the week: How many Syrian towns have Russian airstrikes aided?